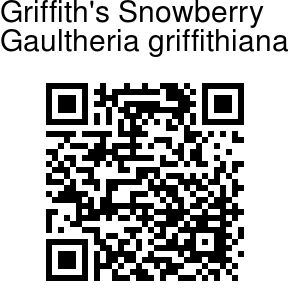 Griffith's Snowberry is a stout shrub, 0.5-3 m tall. Tiny greenish white flowers are borne in many flowered clusters, 2-6 cm. Bracts are ovate to orbicular-ovate, 2-7 mm. Flowers are white, light pink, or pale green, 5-7 mm, broadly bell-shaped, hairless, petals very short, curled back. Flower-stalks are 3-9 mm, bracteoles 2, ovate, 1.5-3 mm. Sepals are triangular-ovate, 1.5-3 mm, tip blunt to pointed. Leaves are scattered, carried on 5-10 mm long hairless stalks. Leaves are oblong, elliptic, or lanceshaped-oblong, 6-17 x 2-6 cm, thickly leathery, abaxially densely punctate, hairless above, veins 3 or 4 pairs, fine veins raised on both surfaces, base broadly wedge-shaped to somewhat heart-shaped, margin closely toothed, tip long-pointed, often falling off. Fruit is a black berry, 4-6 mm in diameter, with blunt sepals. 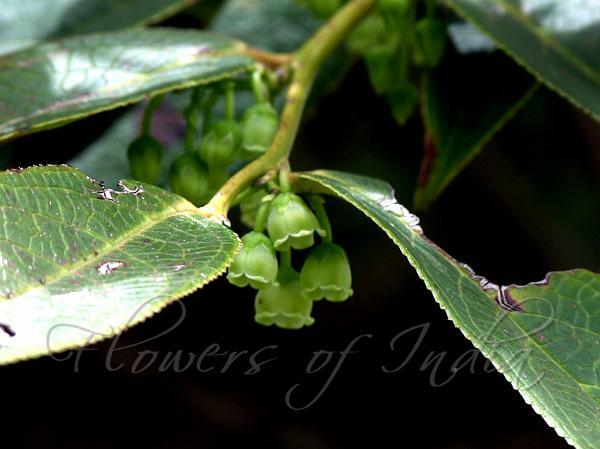 Griffith's Snowberry is found in the Eastern Himalayas, from E. Nepal to Arunachal Pradesh and Myanmar, at altitudes of 2100-3000 m. Flowering: April-June.